Synopsis: When Rodney Baze mysteriously disappears and law enforcement fails to follow through, his older brother, Russell, takes matters into his own hands to find justice. Review: One could be forgiven if one missed the fact that the crime drama Out of the Furnace was released amongst the higher profile films this holiday season. With so many choices up for consumption in our multiplexes it can be easy to miss these more character driven films that eschew mind numbing special effects in favor of honest performances that work their own kind of magic on an audience. I myself almost missed the movie, nearly letting it slide to my “Watch at Home” pile that tends to get loaded up around this time of year. 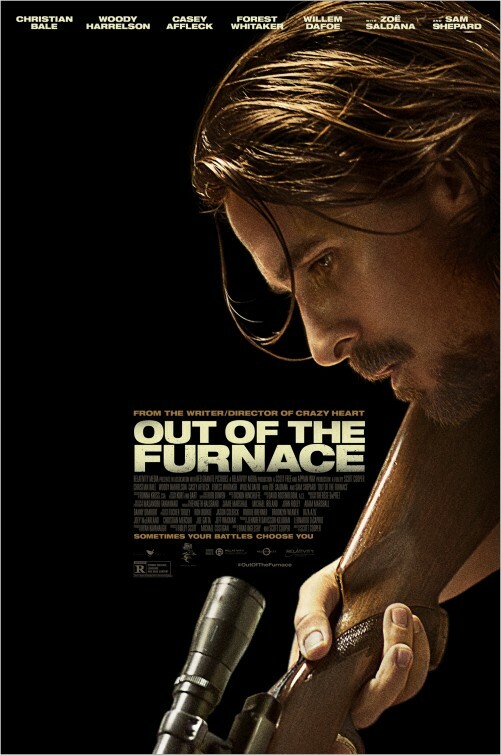 Something drew me to the film, however, and I’m glad I made the effort because with stellar performances, crafty direction, and an overall ominous feeling of danger Out of the Furnace may just find itself on my shortlist for favorite films of 2013. Christian Bale (Batman Begins, The Dark Knight, The Dark Knight Rises) proves again that he doesn’t need a batsuit or a big budget to show he’s a helluva good actor in his performance as Russell Baze. A good natured man that keeps a watchful eye over his brother (Casey Affleck, ParaNorman, showing again that the Affleck Talent gets better with age), uncle (Sam Shepard, Mud) and his dying father, all while holding down a job in the town mill. When a mistake puts Russell in prison for several years, he’s faced with finding new ground in his old life when he returns home. What could have been another reworking of a tired plotline turns dark when Russell’s brother goes missing and he sets out to find the people responsible. Don’t think that this is a variance on Death Wish, though, even if the look, feel, and performances seem to be plucked right out of the mid 70’s. This is a character driven story written by Brad Ingelsby and director Scott Cooper (Crazy Heart) that lets the actors do the heavy lifting in a script that’s relatively light on dialogue if you really sit down and think about it. Along with Bale and Affleck’s rock solid performances, Woody Harrelson (The Hunger Games) makes for a frightening hick at the center of a ring of bare knuckle fighting and drugs. Harrelson started out as a dim bulb light comic on Cheers and continues to produce diverse and interesting performances, refusing to be pigeon-holed in one genre. I wasn’t sure about Willem Dafoe’s (John Carter) greasy loan shark at first, thinking that 10 years ago he would have played Harrelson’s role but something about his duck tailed hair and cheaply fancy clothing rang true. Forrest Whitaker (Lee Daniels’ The Butler) seems a tad too old for his character but still manages to smooth things out thanks to his smartly restrained instincts. If there’s a nitpick to pick, I’d say that everyone in the film seemed to be going for a whiskey soaked manner of speaking that came off feeling like everyone was trying to “out gravelly voice” each other. Whitaker, in particular, sounds just this shade of producing a sound that appears to have originated near his belly button. This is male heavy film with only Zoe Saldana (Star Trek: Into Darkness) as the lone female with a substantial role (I’d say there are about 4 small female speaking roles in the entire film). In fact, the movie is so testosterone heavy that even the daintiest of ladies should bring their travel Nair with them in case they were to sprout a mustache during the films running length. Cooper has assembled all these strong parts into a grim, gritty experience that’s aided by strong location shooting from cinematographer Masanobu Takayanagi (Silver Linings Playbook, The Grey) in a Pennsylvania industrial town and a moody score from Dickon Hinchliffe. I don’t think Cooper needed an extra shot in the final moments of the film but aside from that the movie is edited to keep things moving without sacrificing the strong work the cast is putting forth. So if you can find this one in theaters, know that the other blockbuster choices will still be waiting for you in a few weeks and try this one out instead. Those who warm to smoldering dramas with a hard edge will find a reason to head into Cooper’s Furnace.